Let's take a close look at my list of vintage watches that are under 5000USD and popular these days. I wanted to gather some of the vintage watches that are popular and under the 5000$ price range in a list. Most of the brands and models are from common watch brands that might went under your radar while new models being introduced to the market progressively as a result of competition of the modern watch industry. These vintage pieces might not be as technological as the modern watches which are more durable and long lasting but they have succeed to enter most of ours' collections and even excite us more than the new modern pieces with their designs and small details. Contograf; my favorite is the reverse panda dial version; featuring some exciting details such as pump pushers and chamfers on the lugs. The rotating bezel, buton markers, red-black roulette date wheel. The 60's manuel winding Cal.310.82 Contograf also has a re-issue nowadays. Ref. 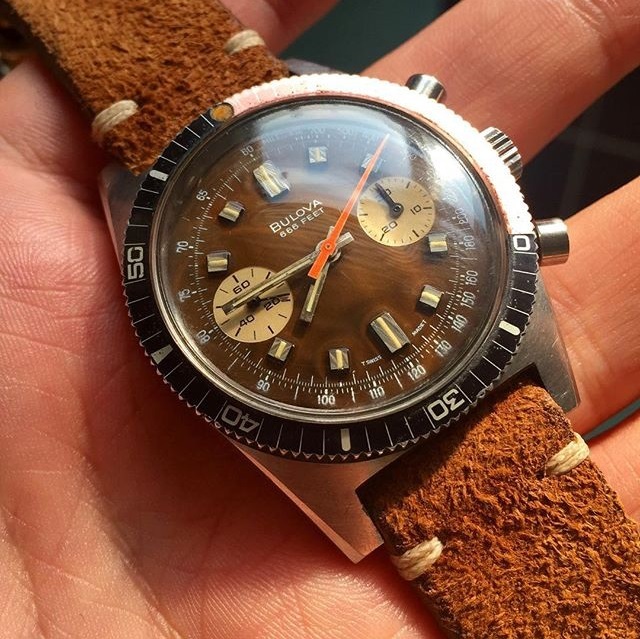 165024 which was introduced in 1964 is one of the most popular vintage-divers. It has the automatic cal.552 movement which was being used in many models by Omega during 1958 - 1969. The most exciting parts of the watch is the ''Sword Hands''. SM 300 also has a military-issue. We are familiar with the sword hands application from the ''Mil-Sub'' Rolex models. The sword hands are capable of holding more tritium material on it's surface so it provides more light to the dial when it is left in the dark after exposure to the light. Bulova Deep Sea Chronograph ''B'' is a divers watch with a chrono function which was produced in 70's. It is featuring a manuel winding Valjoux cal. 7733 movement, inside the 37 mm steel case. I think the faded ''coke'' and ''grey/blue'' inserts give an extra charm to the watch as you can see in the pictures. 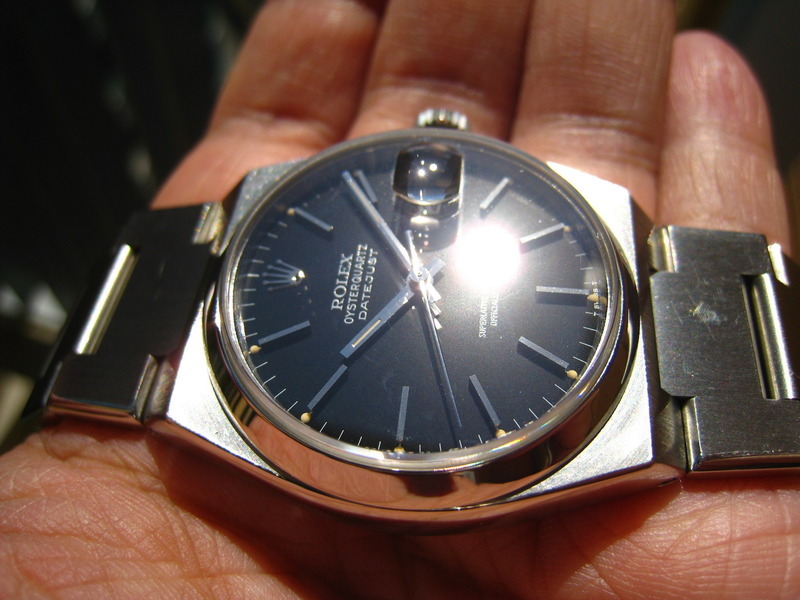 Rolex produced 5 different OQ models between 1977 - 2000. Ref. 17000 in the pictures is produced in 1979. Even though it is not the most popular model of the Rolex line-up due to the quartz movement, I think the sapphire glass OQ has a compact and useful desing; not to mention the Gerald Genta style lines of the case and the bracelet. We are all familiar with the legendary history of the Omega - Speedmaster, known as the ''Moonwatch''. We can see there are different vintage Speedmasters featuring different details in different references and the prices are going highly over the limit we have set. But this particular one we took in the list is not over our limit. The roots going to 1940's Chronomat is one of the most popular models of Breitling with its 37 mm case. Ref. 808 has the Venus 175 manuel winding chronograph mechanism. I think Chronomat is a great watch for those who likes ''Military'' themed watches and those who like to wear them in different strap combinations.